Louvre | Poverty, Agony, Distress & Want! Day 10 kids and guess what? You probably guessed wrong, so I’ll tell you…I’m sick. Ugh, I knew this would happen. You get rundown physically, your immune system can’t keep up and bam! My throat is a bit sore and I can feel it in my lungs. It’s okay, I’ll tough it out (really, what else am I going to do). It’s the Dadistel way right? Today is our last full day on tour…it’s very fitting that it’s Good Friday, the most solemn day in the Christian calendar. I think there are a lot of mixed emotions; it’s sad to be on the last day of the tour, but I think for a lot of us maybe it’s time to start thinking about home. I know that I miss my wife and my kids and it would be nice to see them again. 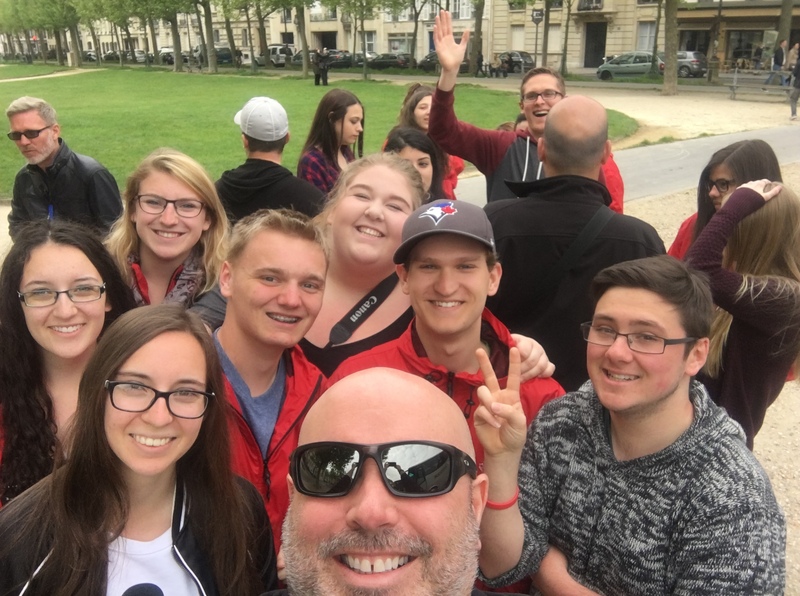 Our agenda this morning starts with a bus tour of the city of Paris, followed by a pizza lunch, the Louvre and then whatever we have time for. The bus tour was great as always. Our tour guide was Stephanie, who was very knowledgable about the sites. After about an hour of driving, we stopped at Les Invalides for a break and a photo op. From there we drove to Place de Trocadero, which is “the” place to get photos of the Eiffel Tower. 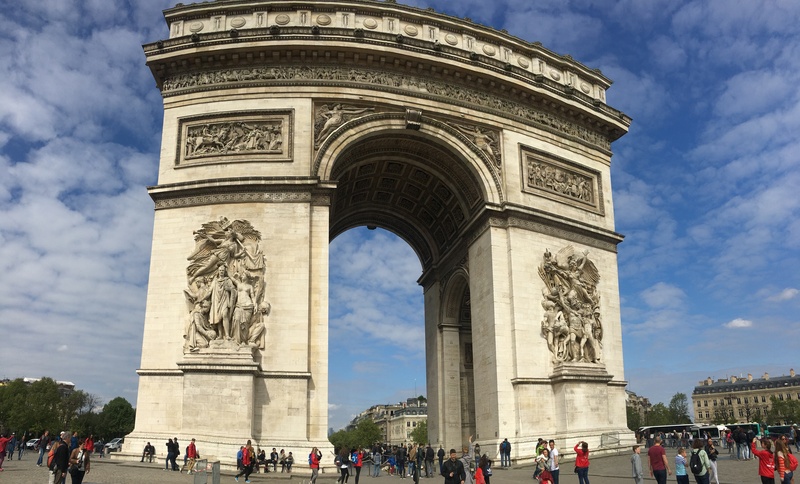 Back on the bus, our final stop was the Arc di Triomphe on the Champs-Élysées. Leaving Stephanie and the bus behind, we got an up-close view of this amazing landmark before leaving for lunch. Les Invalides selfie, April 2017. 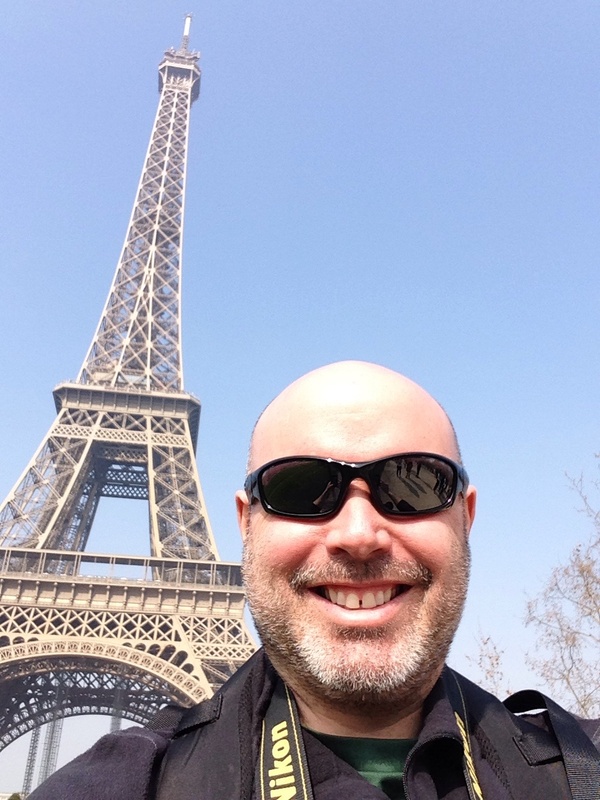 Eiffel Tower selfie, April 2017. Arc de Triomphe, April 2017. Lunch today was covered by EF and was at a place we had eaten on previous tours, Flamme’s. I didn’t realize it was a chain, and the location we ate at was not the one we’ve visited before. Flamme’s is short for Flammekueche, which is an Alascian style pizza. 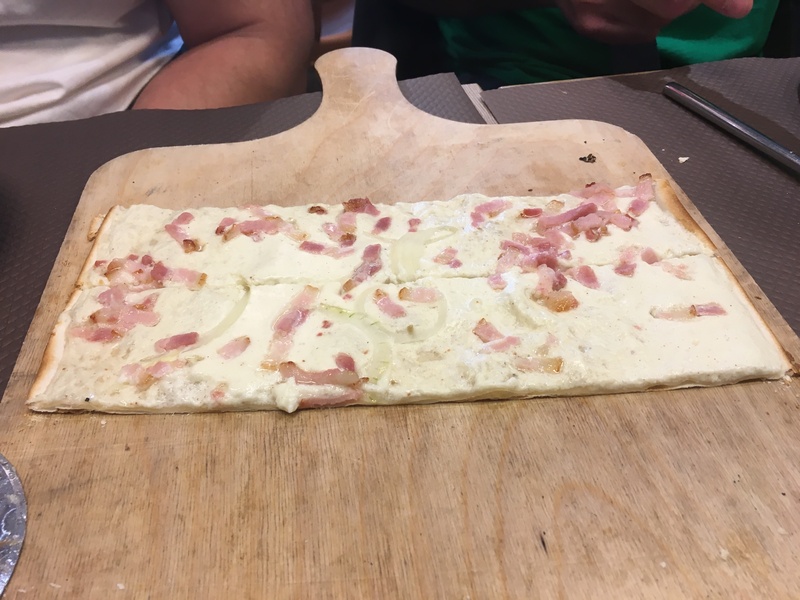 It has a very thin crust, and is topped with some form of white sauce and various meats and veggies (bacon, onions and mushrooms). It’s all you can eat, which I know the kids appreciated. 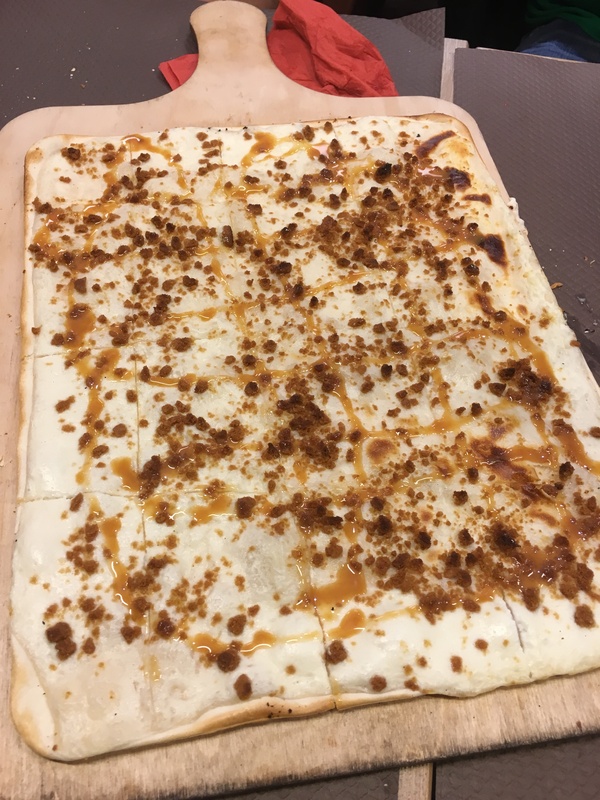 It was finished off with caramel, chocolate and apple desert flammekueche, which was delicious. After lunch we walked the two kilometres or so from the restaurant to the Louvre. 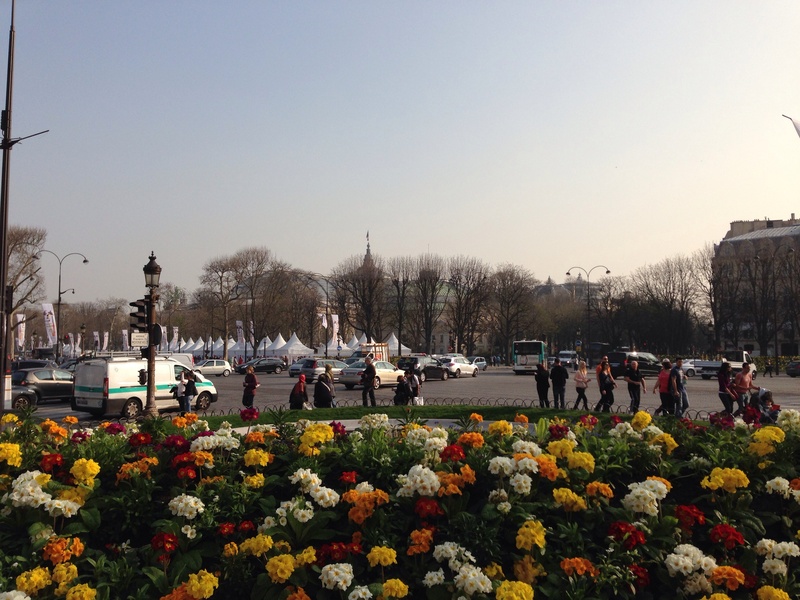 It’s was very pretty in the warm temperatures and vibrant colours of spring through the Tuileries Garden. 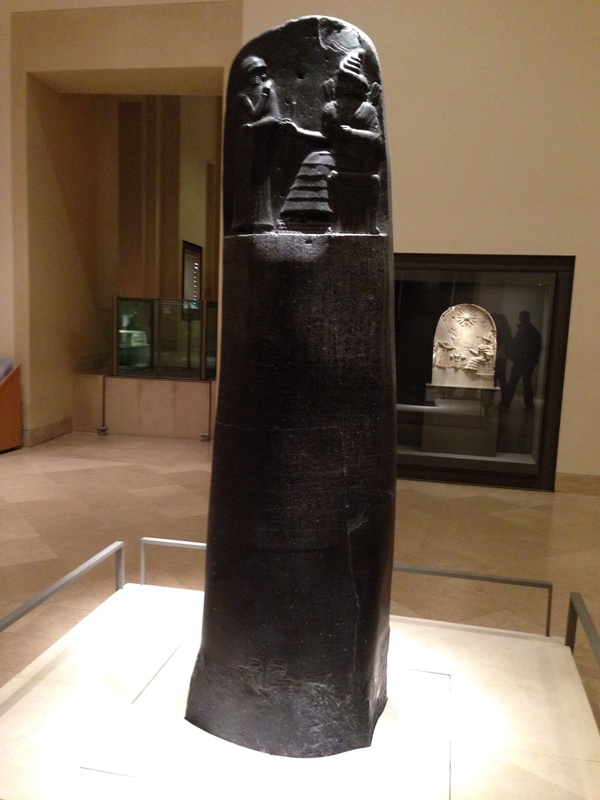 Unfortunately our visit to the Louvre was extremely brief; two hours is only enough time to see a few things in the enormous museum. Since I was there twice already, I followed Ms. Caza on her mandatory journey to see the Mona Lisa. We’re on the bus heading away from Paris…it’s always sad on the last day leaving the city. It was a nice end to the day. From the Louvre, we walked a short distance to Notre Dame Basilica. It is such a beautiful church, which made a big impression on the kids. I’ve been there on two other occasions and I’m still struck every time. The only thing that has changed is the security around the basilica, with police checkpoints and armed military patrols in the square. It’s a sad reality of the times we live in. Notre Dame Basilica, April 2017. From Notre Dame we hopped the Metro to our restaurant for dinner. This by far was our most stressful ride. It was packed, and more people kept coming on the car my group of 9 were in. When we got to our station, Gard du Nord, we had to push our way out of the car; the kids followed my instructions to a tee-polite and aggressive. Dinner tonight was at L’Orange Vert, a short distance from the Metro station. It was okay; salad, carrots and a type of Sheperd’s Pie. After dinner we walked to our pick up point for the bus transfer back to the hotel. If you read the Day 8 post, you know why this is delayed. Day nine, our last day in Europe 😦 Man, the time has just flown by. I guess as they say that’s what happens when you’re having fun right? We’ll have to make the most of today and enjoy every moment. So the internet (or as they say here the “wefe”) is still down, so I still cannot post yesterday’s blog. Hopefully it will be working by the time we return today so I can catch up and everyone knows we’re still alive. It’s amazing how we come to depend on it…first world problems right? Anyway, we will be leaving the hotel at just after 8:00 so we can start a sightseeing tour of Paris. Should be interesting and give us a good sense of the city (well, maybe the kids since I’ve seen it before). Not quite clear on this afternoon’s agenda, but I know a lot of them wanted to go up the Eiffel Tower. Great, more stairs! Well, I’m sitting here at the north gate of the Hotel des Invalides as the kids work through the museum with Mr. Cappello and Ms. Borgo. 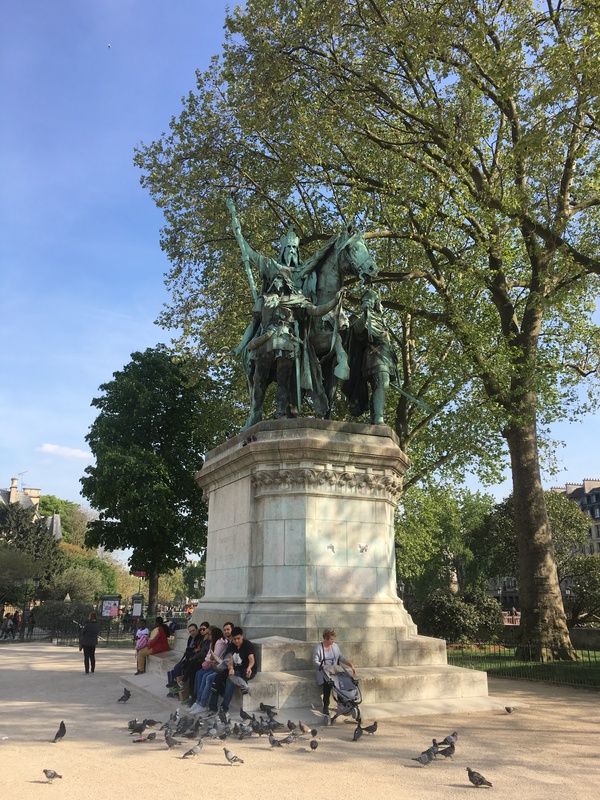 Normally I wouldn’t pass up a chance to visit a military museum, but I just wanted to sit for a bit and while I did that I could work on the blog. I figure it’s going to be another late night and I have two blogs to post. I’m resting in the shade as it is probably well over 20C outside…it is absolutely gorgeous! I’m going to be sad to leave this behind for the snow and cold of Thunder Bay. I do miss the boys though and I guess it is time to head back to realty. So the day has been great so far. A bus picked us up at the hotel and brought us into the centre of Paris where we met up with our guide for the morning. Corine would take us around the major sites in the city to give us a bit of sense of what Paris is like. 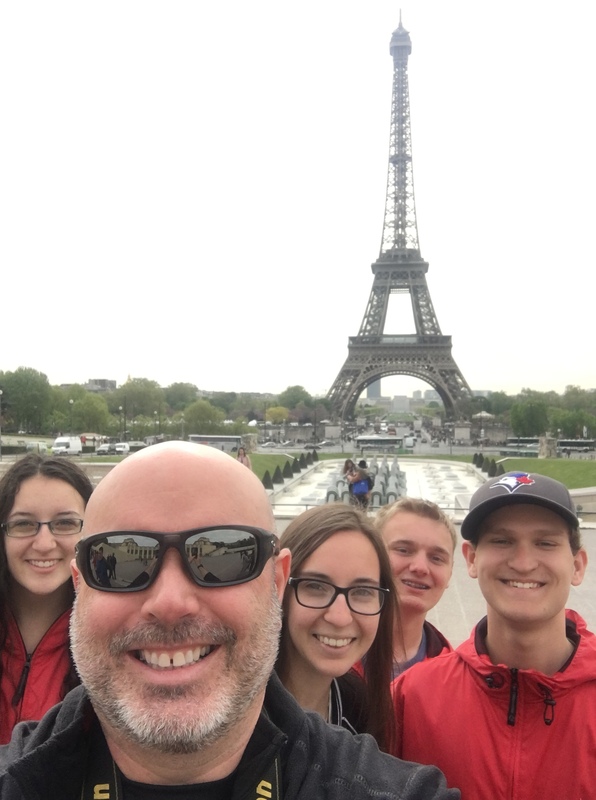 We made a few stops along the way, the last of which was at the Place du Trocadero, which gives a good view of the Eiffel Tower. 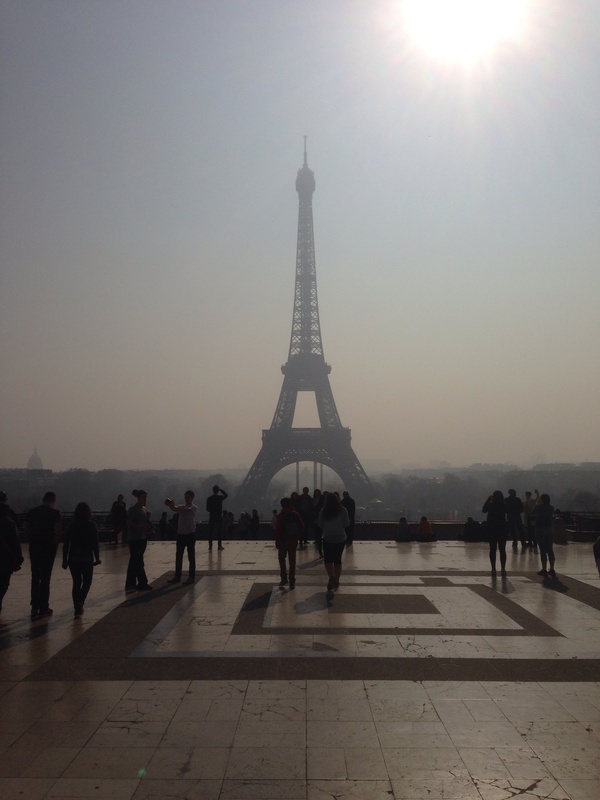 Unfortunately there is a lot of pollution in the air, which made the view less than ideal. Place du Trocadero, March 2014. Sigh. I’m sitting again, this time outside a perfume museum just north of the Paris Opera. I’m tired…exhausted would probably be a more apt term. It’s been a long day! 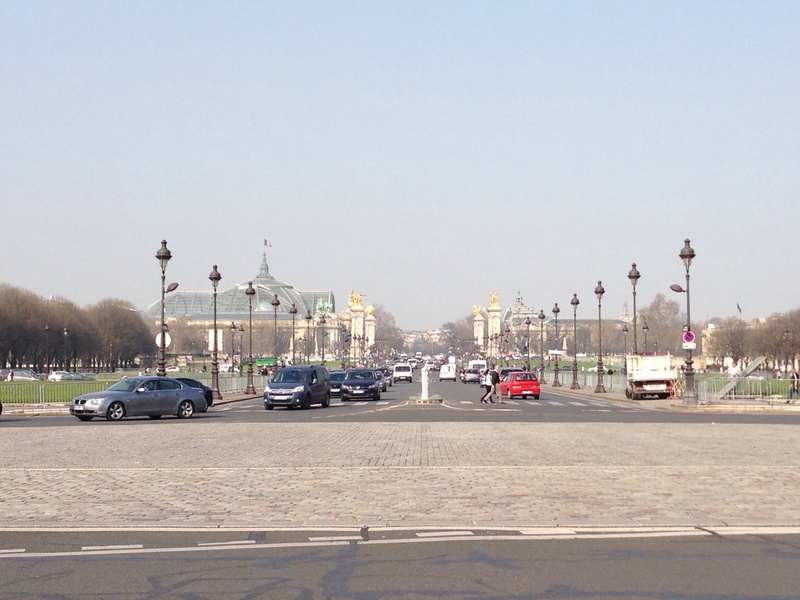 So after the Hotel des Invalides, we headed north across the Seine to the Champs des Élysées. The kids had a little time to look around before we were off again, this time to the Opera and a rendezvous with Felicity and the St. Ignatius crew. We walked the short distance to the perfume place and soon we’re off to dinner. Alexandre III Bridge, March 2014. I’m beat! My feet are killing me! It has been a very long day. We are waiting for the bus to come and take us back to the hotel. I can’t wait to go there and put my feet up. I’m sad that we leave tomorrow (especially since we have to be on the bus at 7:30), but we’ve had a great trip. Dinner tonight was at a place called “L’Arlequin Cafe,” which was quite a distance from the Opera. That made for an interesting ride on the Metro in which we were packed into the cars like sardines. Dinner was some sort of beef stew with carrots and potatoes, which was okay. Dessert was fruit salad. 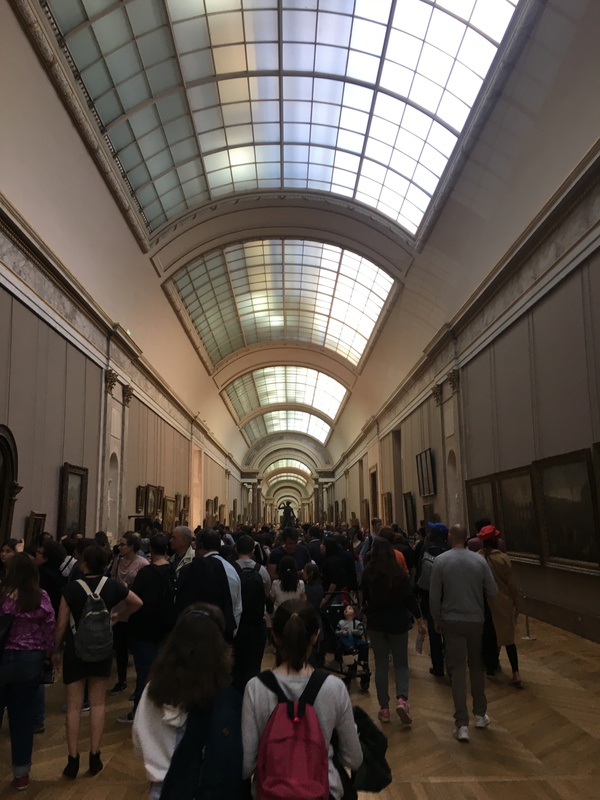 Our night would conclude with a visit to the Louvre, which involved another packed ride on the Metro back in the direction of the Opera. A lot of the kids were excited to visit this fantastic museum. We didn’t have a lot of time, so our little band did the Mona Lisa, Venus di Milo and Hammurabi’s Code. So I’m sitting here on the floor just outside of the Denon Gallery of the Louvre. I am completely exhausted! What a day! So our plane arrived almost an hour late, and then we have to wait forever for our bags. Of course mine was one of the last, coming out almost 15 minutes after everyone else got there’s. Then we met our Tour Director Hugo, boarded the bus and went to our hotel. As we expected, we could not check in and instead stored our bags until tonight. After a quick meeting and bathroom break, we were on the road again. 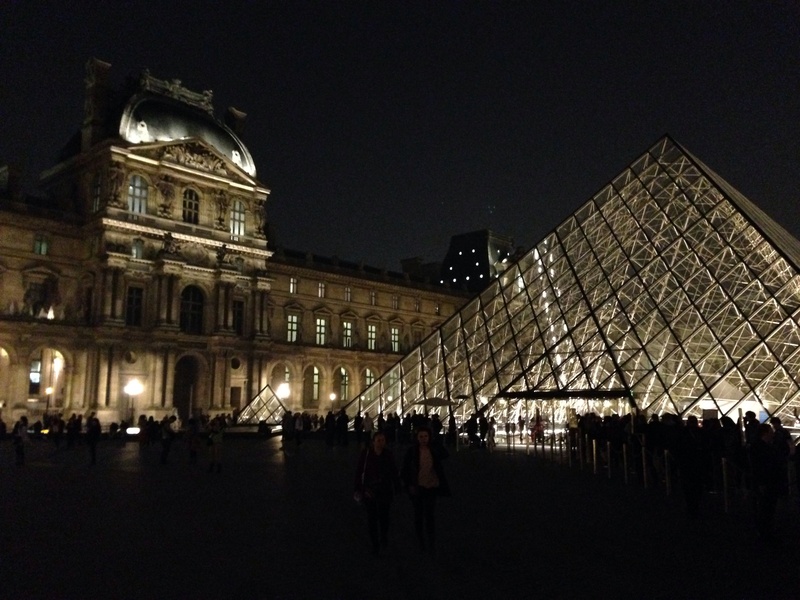 It took us almost an hour to navigate the streets to reach the Louvre. Paris is a beautiful city, but I would never want to drive here; talk about insanity! We almost got into a dozen fender-benders by Canadian standards, but I guess people are used to it here. When we arrived at the Louvre, it was lunchtime, so Hugo gave us an hour to eat. The food court was insane! There were a lot of choices, but I was too tired and hungry to bother…I ate at McDonalds! Yes, I know what you’re thinking, but it was the easiest choice. Only Matt J tried some local fair; everyone else opted for McD’s or pizza. I did promise myself that tomorrow, when I’m rested and have time, I’ll eat better! Now the Louvre. Wow, what a place! We only visited the Denon Gallery, but it was amazing! I’m sure it would take days to fully visit this place…unfortunately everyone is exhausted, so that’s why we’re chilling on the floor. I’d love to take my Gr. 11 history class here when we do the Renaissance. The only bad part was that we kinda got lost, and couldn’t figure out how to get to the lobby. It didn’t help that they closed one of the floors we came in through, so we couldn’t just backtrack. Obviously it all worked out in the end. After leaving the Louvre, we did a “little” walking tour of the area. It was more like a two hour power walk, which was especially nice on a couple hours sleep. We did see some great stuff, but it was all too fast. There was finally a 30 minute break near Notre Dame, which gave me a chance to wet my parched whistle to the tune of 2.70€. Need to bring the water bottle tomorrow! 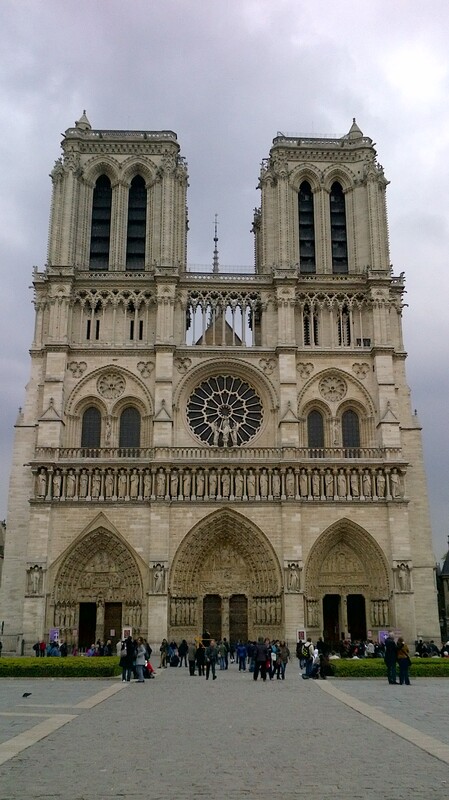 Notre Dame Cathedral, April 5, 2012. 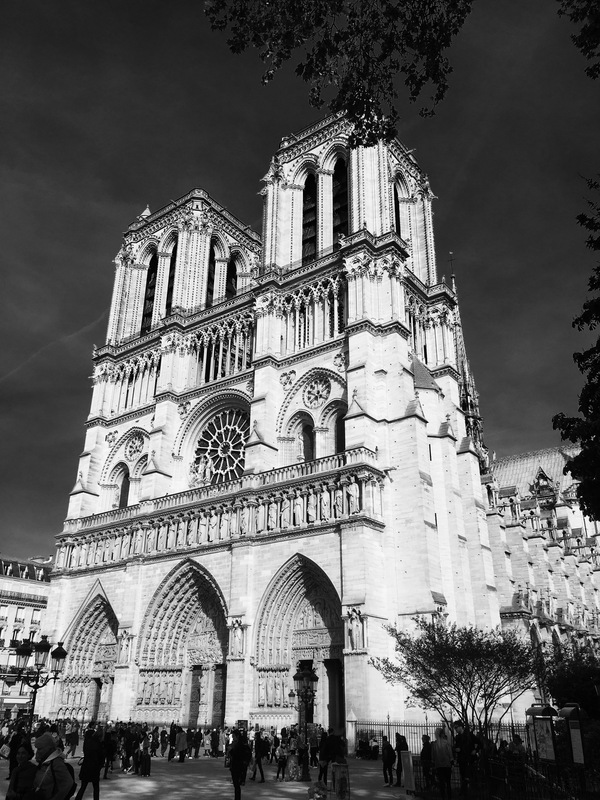 Notre Dame was magnificent…too bad I could not see the inside (we are going to come back tomorrow). This week is holy week, so there are masses every night and the cathedral was full. It is truly a architectural marvel. Within walking distance was our restaurant for the evening Lodies. We had a nice dinner of salad, whipped potatoes and roast pork. The chocolate mousse desert was a nice touch. Now we’re on our way back to the hotel to check in and hit the hay…I think everyone is falling asleep on the bus. I have to upload these latest blogs and then retire myself as we have a 6:30 wake up.